Internet Archaeol. 25. Williams. Caravanserais. Within the suburban area examined for this article there are a number of possible caravanserais. These are identified in part due to assumptions regarding their shape and scale and their extra-mural location, a place where we might expect to find such establishments. They would have acted as transhipment areas, victualling caravans and providing storage for goods, both to be taken further along the Silk Roads on another caravan, or dispersed into the urban markets of Merv. The best example is in the north of the area, in the land immediately to the south of the road leaving the west gate of Sultan Kala (Fig. 59). Here a substantial structure with two courtyards seems to fit the classic double enclosure pattern. The westernmost complex has a square courtyard, c. 50m across, with semi-circular external towers at the corners and wall intervals. The second courtyard is about the same size as the first, c. 55m across, and perhaps reflects the separation of storage and stabling from domestic occupation. Figure 59: Caravanserais to the south of the main road leading from the west gate of Sultan Kala (detail from IKONOS satellite image). To the north, a well-preserved double courtyard example; to the south, a less well-preserved example. 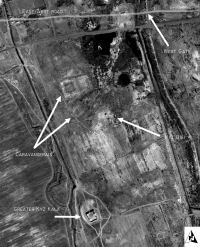 Immediately to the south of this complex there appears to be another double courtyard complex, although less well preserved than the first and less clear on the satellite image (Fig. 59). It seems likely that this represents a second caravanserai.